External DC Adapter functions Set Hi / Lo limits using absolute values or percentage limits. FEATURES :Backlight Display.Damaged or open fuse detection function.Strong Protective Holster.Max / Min / Avg recording.Auto-Power Off Built-in test fixture or use external Test Leads Relative mode with zero reference or user supplied reference.Automatic blown fuse indication. Basic measurement accuracy 0.1% & speed upto 10 meas / sec. Large LCD display with bright white backlight. Ultra low power consumption, battery powered for 24 hours of continuous use. Automatic correction function with datahold, max. / min. / average recording. Utility function configuration & current setup recovery after power off. Field maintenance test & external carrying test. Fixation point on production line or mobile checkout. Warehouse & real time spot or batch inspection. 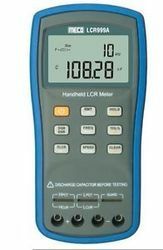 Looking for LCR Meter ?